It must be frustrating when your programs stop responding while you are working on your system. Operating Systems tend to hang up when these programs stop working and this could lead to loss of unsaved data, which can be a very annoying experience. When the programs stop responding and the system hangs, what the users can do is type Ctrl + Alt +Del.This will open the task manager, which will show you the program that is not functioning properly and gives you the option of closing them by clicking on End Task. However, not always do these problems get resolved so easily. There are several reasons as to why these issues crop up. Here is a look at some of the causes and solutions to these problems. These problems can be caused by out of date or faulty drivers. As a result the corresponding device associated with the driver may start malfunctioning. Make sure you download the correct version from the internet that is compatible with your OS. You can also check by going to Windows Device Manager and spot if any exclamation or red X marks are marked on any of the devices. In many cases this has been the culprit. New software’s that are bugged and incorrectly installed could lead to conflicts with older programs in the system. Uninstall and reinstall them correctly to see if the errors persist. Also, check for newer versions and updates on the internet. Sometimes, the Operating System can be the reason for the hang ups. Make sure the OS is functioning well with proper updates. If the problem persists you may have to reinstall the OS. This is one of the worst kinds of issues faced by consumers all over the World. Many people fail to see the need to install good antivirus software’s to prevent and keep away from the malware threats. Once these malwares enter the system they corrupt the software’s and the OS leading to frequent hang ups and programs also stop responding as a result. Hence, it is very crucial to use good antivirus software to maintain system performance. Computers also show a tendency to heat up quickly. This may be because of heated surroundings. However, usually it may be because the fan in the CPU may not be functioning properly. Open the casing and make sure the processor and the case fan are working properly. Also, try as often as possible to work in settings that are pleasant or in an air conditioned room. 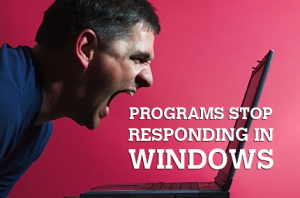 Programs can stop responding due to hardware failures as well. One of the hardware devices like RAM, motherboard, hard disks may be failing and this affects the working of the PC. Also, removal and addition of old or new hardware’s may also have an impact on system performance. In order to check that, go to Device Manager and look for any device that might have not been installed properly. If that is the case remove the device and check if the system is working fine. If the device is the problem, uninstall and reinstall with the correct driver to match your system specifications. Guest Author Fenix Raw is from ExamsKey. Looking for Exams key exam assistance? Let’s take benefit of Exams key self-paced CCDA Certification Preparation Certification training material and pass your IT certification on first attempt with guaranty. Next Entry: How VPN Allows Access to Blocked Websites? Next Entry How VPN Allows Access to Blocked Websites?